I first started reading the Sookie Stackhouse series a few years ago. I'll admit, I didn't exactly enjoy them - there were a lot of things that annoyed me, especially when I was in editor mode - but for some reason, I kept reading and managed to get through 4 books before giving it a break. A long break. I guess I just like to give certain series a chance, or there's a glimmer of something interesting enough to keep me reading, even when I think I should stop. Or I'm just a bear for punishment. 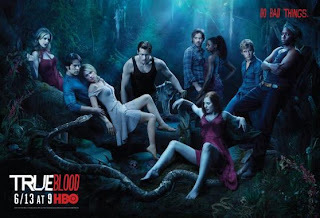 Anyway...when True Blood came out, I was curious about it but I don't get HBO. Everyone and their great uncle Fred seemed to love the show, and I was desperate to watch it, so was surprised and thrilled when I discovered my library got the DVDs when they received new funding. I loved the show instantly and decided it was time to give the books another shot. 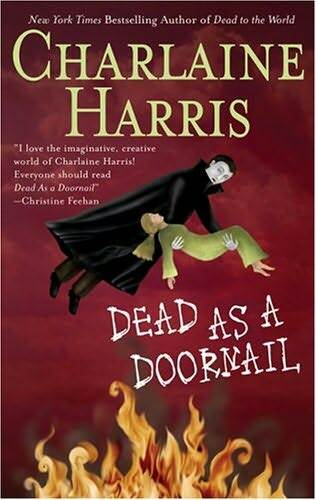 Since it's been a couple of years at least since I read the previous book in the series, Dead to the World, I'd forgotten what happened, but a lot came back to me as I read Dead as a Doornail. And you know what? Despite the fact that a few things still kind of bothered me, I actually really enjoyed this book. I don't know whether it's because I'm able to picture the actors as the characters now, or because I realize that Sookie and Jason are supposed to be that stupid, or what. I like how the series follows along and touches on things that happened in past books, but doesn't dwell on them. The rather large cast of quirky characters keep things interesting, and the few new additions add to that interest. I only have 2 real complaints, one is technical, and the other has to do with the story itself. The technical one is that certain parts are too detailed. I don't need to know what Sookie does in the bathtub or that she needs to drop off books at the library and movies at the rental place. I remember that being one thing that really bothered me before, but it didn't seem quite as bad this time. The other thing was how many love interests does Sookie really need? By my count, there were six in this book. Yes, six. It's beginning to seem like she's sexually attracted to every guy she meets, plus of course the old standards, but she can't make up her mind which to be with, or whether to be with any of them. Overall, I’d recommend this book if you enjoy paranormal romance or mystery. It’s funny, kinda weird, and a quick read. I don’t think I’ll wait a couple years before reading the next book, Definitely Dead. I don't like it when books are overly detailed either. It's nice to paint a picture of what the character is doing, but not to the point where I know everything in their fridge. This is an amazing read, as are all of the Southern Vampire books by Ms. Harris. Sookie Stackhouse's world is full of adventure and love in the least likely of ways. When you are cheering for one character, all of a sudden you're falling in love with another, right alongside the main character, Sookie.